The Reptoids Slot by Yggdrasil is another interesting online slot of the Swedish company. And again, the software developer for online casinos comes up with some nice specials. 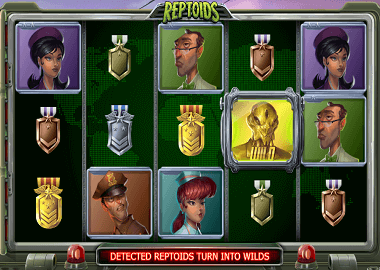 The slot is all about aliens and people with reptile heads – Reptoids! And of course, the reptoids chase the aliens over your reels. Yggdrasil’s Reptoids Slot has 5 reels with 3 symbols and 20 paylines. You have an Alien Scanner, an Extra Bonus feature and a Free Spins feature – all useful features for extra winnings! Symbols and payouts: There are no cards symbols in the Reptoids Slot. Instead, there are various medal symbols as low-paying symbols. In addition to these symbols, there are 6 different human: policeman, stewardess, soldier, manager, doctor and a policeman. The Manager symbol is the most valuable symbol and pays 1000x your bet when combined with 5 symbols. The game is the aliens symbol. But the best symbol is your scatter: you can win up to £ 100,000 with up to 5 scatter! Reptoids Bonus Feature: The Reptoids Bonus Feature is the most interesting feature on the Reptoids Slot. It turns up every time while you spin your reels in the base game and in the Free Spins feature. Then an “alien scanner” rolls over your reels. It scans all the time your symbols. When it finds an “alien”, this and every identical symbol becomes wild. However, if the scanner finds a scatter symbol, the Free Spins feature will be triggered. Reptoids Free Spins Feature: The Free Spins feature is the best feature on the Reptoids slot. Again, the alien scanner will give you extra profits. If you find valuable symbols here using the scanner, they will stay wild until the end of the feature. You will also see how many high symbols you have already collected. For every alien you find, you get one extra spins. You can collect up to 6 extra free spins this way. In addition to the many nice extra features of the Reptoids Slot, the designers and graphic designers have also done a great job. If you do not know any Yggdrasil slots, you can find more nice slots here. You can also play all video slots for free! Famous Yggdrasil slots are Sesons or the Orient Express slot. Also with these slots there is cool bonus feature! Yggdrasil online casinos are not very common. We only have 3 online casinos where you can play these games. One of them is the Videoslots Casino. If you register there you will get even 11 Bonus Spins for free. Other recommendations include the Rizk Casino and Guts Casino. Alternatively, you can play the Reptoids slot with us for free. Just click on the banner and let’s go! Spin the reels as long as you like!